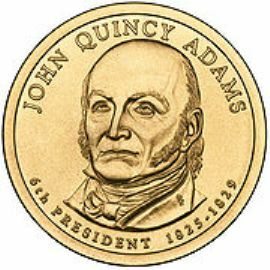 The John Quincy Adams Presidential Dollar marks the sixth in the series. The coins were first released into circulation on May 15, 2008. Adams served only one term in office from 1825 to 1829. Some interesting facts about him include naming one of his sons George Washington. He also was the first president whose father had been president before him. Another little known fact is that he was the first president to marry a foreign born woman. His wife Louisa was born in England. The obverse of this golden dollar shows a portrait of Adams with his name inscribed above, and "6th PRESIDENT 1825-1829" inscribed below.